Stop in, visit Leann, and enjoy one of our many variations of the classic American hamburger or hot dog! Now featuring Brats and soup as well! As always, we feature $1 Yuengling pints all day! Also, enjoy the sounds of Strums and Drums! Strums & Drums formed in 2016, by Adreanne Foos (guitar + vocals) and Jeff Foos (drums + hand percussion). The duo performs a variety of music, focusing mostly on writing original music and always entertaining crowds with fan favorite cover songs. 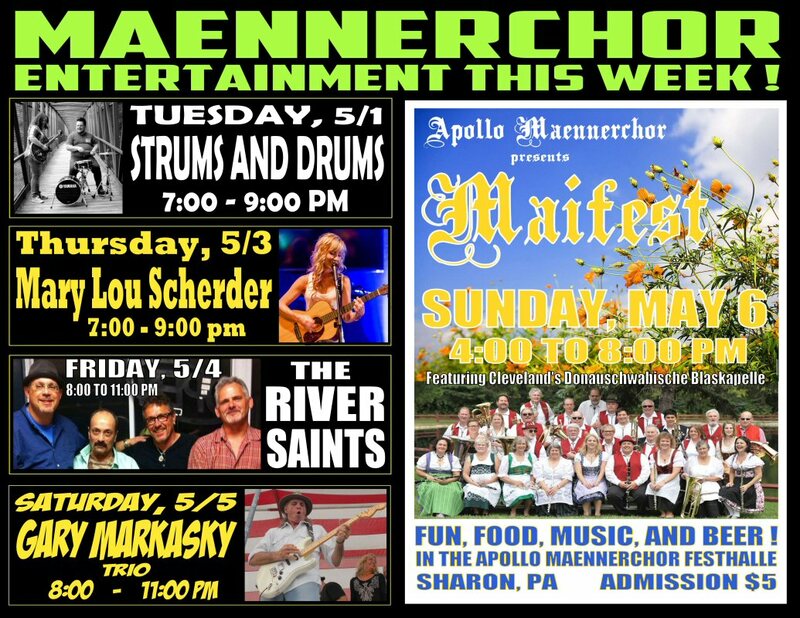 Pittsburgh’s solo singer/guitarist Mary Lou Scherder returns to the Club, performing a mix of original music and covers with a heavy influence of country and Americana! Local Blues man Steve Vuich fronts this merry band of musicians, including Greg LaDonne, Kevin “Darwin” Vallely, and Sam Orrico, who are self described as “A REAL BAND PLAYING REAL AMERICAN MUSIC! Blues, Roots Rock, Americana, Country, Soul, R&B.” We think that says it all. Come in and check out the show! Gary Markasky, Warren OH guitar legend and former guitarist for the Michael Stanley Band, leads a trio of talented musicians who play a variety of classic rock covers and plenty of great Michael Stanley Band covers! It really is the next best thing to being there in Cleveland listening to MSB in the 1980’s! This Sunday is our 4th Annual Maifest Celebration. In Germany, Maifest (the ancient holiday of May Day) celebrates the end of cold days, new life, and the beginning of spring and the planting season. We celebrate it German-style, with food, music, and beer! Doors to the Festhalle open at 4:00 pm, and a German buffet will be available while supplies last! The entertainment officially begins at 5:00 pm, with the Cleveland Donauschwabische Blaskapelle, a 20-plus piece brass orchestra featuring polka music and German festival favorites! There will be a special appearance by the Maennerchor Singers. This event is open to the public – admission to the Festhalle AND the Club room is $5.